Aam Panna: Aam Panna is an Indian drink renowned for its heat resistant properties. It is made from green mangoes and it is used as a tasty and healthy beverage to fight against the intense Indian summer heat. This drink is mainly consumed in the Northern part of the India and is considered beneficial in the treatment of gastro-intestinal disorders. 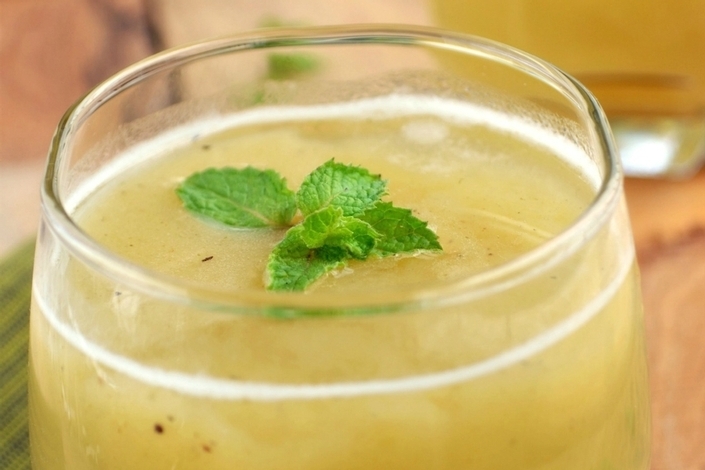 Aam panna which is prepared using raw mangoes, sugar and an assortment of spices is an effective remedy for heat exhaustion and heat stroke. Dry roast the cumin seeds for few minutes, until a nice aroma rises. Powder the cumin seeds, using a mortar and pestle. Blend sugar, salt, half of the mint leaves, half of the cumin powder and ground black pepper in a mixer, to a fine powder. Pressure cook raw mango with enough water (just immersing level will do) until mushy, giving it 3-4 whistles. Take out the pulp alone and discard the seed. Add the pulp to the sugar mint mixture and blend it to a smooth puree (don’t add water). The green mango preserve is ready. For about 500 ml of water, add about 4 tbsp of the preserve and 1 tbsp lemon juice. Garnish with mint leaves and add some ice cubes. Sprinkle with a little cumin powder and serve chilled. The green mango preserve can be kept in a clean plastic container and stored in the freezer for upto a week. This can be used on need basis. Some of the mangoes are very fibrous and the cooked mango should be strained before use.